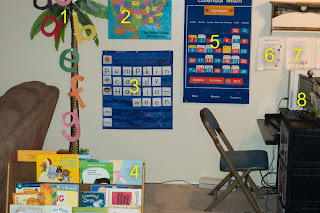 Mommy Lessons 101: Setting Up... Preschool Format #1 - "Our Preschool Corner"
Setting Up... Preschool Format #1 - "Our Preschool Corner"
Meet Rachel who is guest blogging for Mommy Lessons 101... I am a happy mom of two boys and one baby girl. My oldest is nearly four years old, and I do a home preschool with him and his brother who is just 17 months younger than him. Each unit we do takes 1-2 weeks and we focus on a different letter and associated theme. 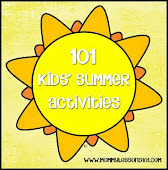 Keep in mind, these boys have short attention spans, so while it seems like we did a lot, it really was a series of 5-10 minute activities spread out of the course of a week or two. Some activities I just did with my older son while the others napped. Other activities we did all together. We really cherish these fun times together. I try to keep it low stress so if my sons are not in the mood or don't seem interested, I don't push them to do something they don't want to do. At this age, my priority is to help them know that learning is fun! 1. We love the book Chicka Chicka Boom Boom, and so we created an ABC tree. As we learn letters, I add them to this tree so we can always have a visual review of what we have learned. I got this idea from here. 2. Map of the United States. My 3-year-old is very interested in places. He loves to point out the states in which all of his different cousins live. He has cousins living in 8 different states! And since he is obsessed with trains, we often read books that refer to different places in the United States, so it is fun to have this map to refer to. We also have a blown-up world globe we use when we are talking about things outside the United States. 3. Word wall. We spell the vocabulary words that fit our theme each week on this wall. 4. Forward facing bookshelf. I love having this forward-facing bookshelf to give my kids easy access to our books. My primary goal for them at this age is to help foster a love of learning and love of books! I got this at a garage sale, but there similar bookshelves online. 5. Calendar. I picked this up at a garage sale, and my boys love finding the date each day and putting cards on the calendar to mark the special activities we have going on. I even made up cards for park days and soccer classes. You can find similar calendars online. 6. Rule chart. The rules of our house are posted here. I typed them up and included pictures to represent each rule. When the kids forget the rules, I bring them back to this rule chart and read it with them. 7. Sticker charts. Each boy has a chart on which he earns stickers for following the house rules. They each picked out prizes that they would like to work towards earning when they have received enough stickers, and we put pictures of those prizes at the bottom of the chart so they can remember what they are working towards. 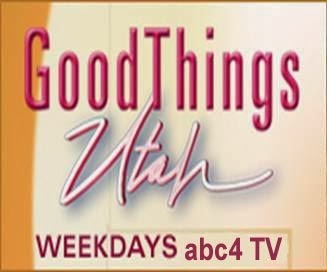 We have good days and bad days, but this positive reinforcement does seem to help them. 8. Computer. When we have "preschool time," we love to have lots of music that I play through the computer, and I often include snippets of informational videos from YouTube, so it is nice to have our preschool area next to our computer.